We consider critical site percolation on the triangular lattice in the upper half-plane. Let u1, u2 be two sites on the boundary and w a site in the interior. It was predicted by Simmons et al. (2007) that the ratio P(nu1 ↔ nu2 ↔ nw)2 / P(nu1 ↔ nu2) · P(nu1 ↔ nw) · P(nu2 ↔ nw) converges to KF as n → ∞, where x ↔ y denotes that x and y are in the same cluster, and KF is a constant. Beliaev and Izyurov (2012) proved an analog of this in the scaling limit. We prove, using their result and a generalized coupling argument, the earlier mentioned prediction. Furthermore we prove a factorization formula for P(nu2 ↔ [nu1, nu1 + s]; nw ↔ [nu1, nu1 + s]), where s > 0. Conijn, R.P. (2015). 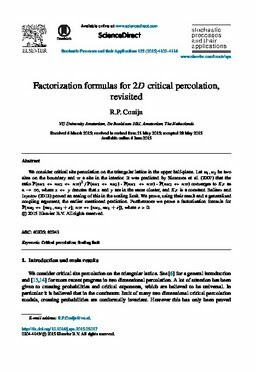 Factorization formulas for 2D critical percolation, revisited. Stochastic Processes and their Applications, 125, 4102–4116.